An Iranian citizen identified as a senior member of the country's Basij military force was caught trying to enter the United States posing as a cancer researcher, according to multiple sources familiar with the situation who told the Washington Free Beacon that the Trump administration should begin investigating how the individual was granted a U.S. visa in the first place. Seyed Mohsen Dehnavi, who has been identified as a member of Iran's highly vetted volunteer Basij force, was turned away from entering the United States at Boston's Logan Airport. Sources familiar with the situation said that Dehnavi is billing himself as a medical researcher and was to assume residency at a Boston-based hospital. He was detained earlier this week at Logan Airport along with his family and later sent back to Iran. A Customs and Border Patrol (CBP) official familiar with the situation told the Free Beacon that Dehnavi was "deemed inadmissible to the U.S. based on information discovered during the CBP inspection." 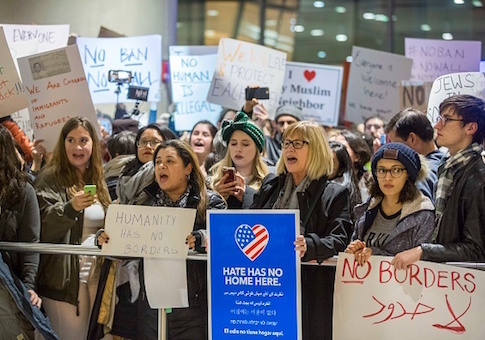 Dehnavi's rejection was unrelated to the Trump administration's executive order on immigration from Muslim nations, according to official, who said that those trying to enter the United States must prove their eligibility. "In order to demonstrate that they are admissible, the applicant must overcome ALL grounds of inadmissibility including health-related grounds, criminality, security reasons, public charge, labor certification, illegal entrants and immigration violations, documentation requirements, and miscellaneous grounds," the official said, adding that Dehnavi was denied entry and sent back to Iran Tuesday evening. While some media outlets have portrayed the situation as U.S. officials preventing an Iranian doctor from performing legitimate work, Iranian sources familiar with Dehnavi's past said that he has close ties to Iran's Revolutionary Guard Corps (IRGC) and its Basij fighting force. "Here are the facts: Mr. Dehnavi is a high-ranking member of IRGC's Basij, has been involved in the IRGC's military research programs, has played a key role in oppressing dissidents, and Iran's Supreme Leader has given him his own keffiyeh as a gift," Saeed Ghasseminejad, a prominent Iranian dissident and regional expert at the Foundation for Defense of Democracies told the Free Beacon. Other media outlets have independently identified Dehnavi as a top Basij member who was involved in efforts to suppress dissident and reformist voices in Iran. The situation highlights growing efforts by Iran to penetrate the United States with supporters of the hardline regime. Iran was one of several Muslim majority nations included in the Trump administration's controversial immigration pause due to its global efforts to spread terrorism and its radical ideology. "He is a well-known figure and a simple Google search would have shown his identity. Why has this not been done?" Ghasseminejad, who has been closely tracking the situation, asked in an interview. "Who in the U.S. facilitated Dehnavi's travel? Did they know they were helping the IRGC to send a high-ranking member to the United States?" Photos posted on Twitter purporting to show Dehnavi's passport and U.S. visa approval have raised further questions about who is responsible for vetting these individuals. Ghasseminejad asked, "How many people like Dehanvi have entered the U.S. over the last few years and are living in the U.S. as the IRGC-connected sleeper cells? In 99 percent of the cases, it is very easy to vet Iranians who want to come to the United States. However, it seems in many cases the vetting process is slow, inefficient and weak. It leaves many pro-U.S. Iranians behind the door and permits anti-American Islamists to enter the country." Dissident voices such as Ghasseminejad said that sympathetic portrayal of Dahnavi's situation in outlets such as the U.S.-funded Radio Farda and Voice of America highlight the Iranian regime's grip over these outlets. Members of pro-Iran organizations such as the National Iranian American Council (NIAC)—which has long been accused as serving as a lobbying shop for Tehran in D.C.— condemned Dahnavi's detainment. Former secretary of state John Kerry, a chief architect of the landmark Iran nuclear deal, also slammed the move in a tweet: "Tragic. A doctor comes to the US to save lives and this happens. This is not who we are." Regime opponents such as Ghasseminejad said that all of these individuals and groups are attempting to shift the narrative in order to portray Iran in a sympathetic light, despite the doctor's ties to one of Iran's most repressive and violent domestic organizations. "Why do NIAC, Trita Parsi, and John Kerry criticize the U.S. government for not permitting a member of a terrorist organization to enter the country?" Ghasseminejad asked. "To embarrass the U.S. government, the U.S.-funded Radio Farda and VOA rushed to portray this member of the terrorist group IRGC as an innocent researcher who has been mistreated by the U.S. government." Ghasseminejad called on the Trump administration to formally investigate these taxpayer-funded media outlets for pushing "pro-Tehran propaganda." Amir Etemadi, another Iranian dissident and Chair of the Iranian Liberal Students & Graduates, described Dehnavi as a "well known member of the Basij military organization in Iran." "You didn't need to be an intelligence officer to find out who Dehnavi was," Etemadi said. "The question is how he could get clearance from the US intelligence agencies, and how the State Department issued visa for him. I think the Trump administration should run an investigation into the case." Dehnavi "wasn't the first Basij/IRGC member who has received the US visa in recent years," he added.